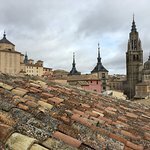 Whilst getting to the hotel in a fairly large car is not for the feint hearted, once you are there you are in the perfect location to explore Toledo. The staff are excellent and willing and able to assist. Parking is underground but just outside the front door costing €12 a day. They assist you to park as it is somewhat tight! Our room had not yet been refurbished but was fine for a short stay. The bed was comfortable and the bathroom adequate to requirements. There is no fridge or kettle and I must admit these would have been useful. Classic Brit, who likes a cup of tea with pasteurised milk after sight seeingall day! Oh but a glass of red wine on the outside roof terrace looking up at the alluminated cathedral and Alcázar was spectacular. This for me Will be a moment that I will never forget. Be ready to be impressed! Breakfast is more than adequate at €5 each and consists of fresh orange juice, a small yoghurt, jamon and tomato on toast, coffee an either fruit or a pastry. Thank you very much for telling us about your experience at the Santa Isabel de Toledo hotel. We are very happy that you enjoyed some good days of rest in our hotel. In recepeción we have jugs to heat water, so the client can make an infusion. It also has a coffee and chocolate machine, mineral water and soft drinks. We also have beer and wine. On your next visit you can book by phone or on our website and we will give you free continental breakfast for two people. Thank you for making our work much easier for us. We will be happy to see you again very soon. Sincerely, Lourdes M.
We spent a night at this hotel and were quite pleased. It's a charming older property adjacent to the Santa Isabella Church on a quiet narrow street. Easy walking distance to the cathedral. The hotel has been updated and renovated and the rooms and baths were comfortable and modern. The view from the small rooftop terrace was incredible. I would stay here again and not hesitate to recommend Hotel Santa Isabel. Room tip: A standard room was adequate in size for two people. As the weather was cool and the location quiet, we slept with the window open. The hotel was nice and comfortable. It´s beautiful and very authentic. The breakfast was included and very good. The rooftop terrace has a very beautiful view. We had a very nice stay here. Thank you! Thank you very much for telling your experience on tripadvisor. It is of great help for future clients. We love knowing that you have enjoyed our terrace with its wonderful views and especially that you enjoyed our breakfast with natural orange juice served at table by my companions. 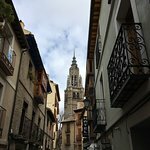 We stayed at the hotel for 3 nights and loved both the hotel and Toledo. The location is perfect within easy walking distance to everything. The people at the front desk are very helpful and speak English. I read a lot of negative comments about the breakfast but I found it more than adequate. You can get a large slice of crusty bread with ham and olive oil on it, two pieces of fruit, the best fresh squeezed orange juice I’ve ever had, a hot chocolate or coffee and a bottle of water. You can ask for more but I was so full after all of that I was good. I’ve included a picture as well. The Cathedral just up the lane is amazing. Just breathtaking in it’s grandeur. One of our favorite things to do was buy a bottle of wine, cheese, salami and bread and have a nighttime picnic up on the beautiful terrace at the hotel looking at the lit up cathedral and other close by convents and listen to all the church bells go off. Very peaceful. I’d also recommend the following restaurants: Taberna el Botera, which we only went to for some fun mixed drinks (which were pricey but fun to watch the bartender). I heard the food was really good but we didn’t try it. The Cucharo de Palo was over off of Plaza Zudocovor and was very reasonable with good food as was Comes in that same area. I’d also recommend the Train Vision (I think that was the name) that takes you around town and especially across the river to get the view of the beautiful city of Toledo. So fun, I miss it already! Many thanks for your detailed tripadvisor comment. We are glad that the clients tell us about their experience in our hotel. Especially that they have enjoyed our wonderful terrace and its good views, also of our complete breakfast, served at table by my companions. We would love to see you again at any other time you have to return to Toledo. Booking by phone directly or through the hotel's website, get the free breakfast. See you soon! Thanks for your attention. Sincerely, Lourdes M.
OK, it has on site parking, BUT.. getting there, through increasingly narrow streets is anxiety/exciting depending on your nature! Needed the reception staff to open the garage door, fold back my wing mirrors and guide me in! Comfortable Room, nice hotel and welcoming warm staff. Recommend it. The hotel is VERY well located, next to the Cathedral in the heart of OLD Toledo. Streets filled with tourists, even when raining! Visit the roof, when NOT raining! Room tip: Inside rooms will be quieter than outside rooms in spring autumn. Thank you very much for your detailed comment. We are very happy that customers value our work, also our facilities. 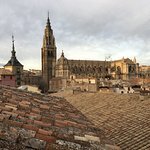 He has made a good description to get to the hotel, Toledo is a medieval city and we are located very close to the Cathedral and the Jewish Quarter. Thank you for telling us about your experience at our hotel. We would like to see you again very soon. Sincerely, Lourdes M.
The Santa Isabel is a beautiful typically charming Spanish hotel. There is a small lift to the rooms and a superb roof terrace with views of the city. The Classic room was very clean and spacious with amazing wooden shutter doors that provide an excellent window blackout! The bed was comfortable and the room is warm in winter. The staff are helpful and friendly. The breakfast was included in our deal and it was very good. Do not expect a giant buffet though. Just a typical Spanish breakfast of coffee, juice, bread, pastry and fruit that the lady brings to your table. The Santa Isabel is right in the centre of the beautiful quaint town but is in a lovely quiet street. We arrived by train and taxi. Car journeys could prove a little treacherous. Would definitely recommend and return.